Porcelain dolls are our primary passion and the possibilities are practically endless. begin a doll creation. In time we hope you will come to know and love them all as we do. one-of-a-kinds as well as custom orders and basic dolls of all the various designs as time goes on. A Limited Edition: All Porcelain 11 inch Little Lou with her Dolly Dear. Small doll made of Air Dry Hearty Clay. LL's Dress by Sandy Daniels. Two more all porcelain dolls by Dianna Effner. This is #7 in an edition of 10. Allison wears a pretty voile dress by Lois Fisher. For her cloche we hand dyed the straw and made the hat using a form from The P and B Doll Company. Itty Bittys dress, hat and shoes were made by my assistant, Geri. Allison is 11 inches tall. "She is one of my personal favorites." D. E.
"Here is Little Bit Country..."
2007. A few extras are still available at a bargain price of $395. As you see she comes with her own made to order miniature guitar. of these little treasures don't put off ordering. I will email you upon receiving the order. Thanks, D.E. Four Baby Dolls: Special Artist Offerings. years ago by my assistant and, Geri Uribe. Some of them were made for the project. painted by me, for the project, I will call "reborn." 11" Aaron was taken from the shelf, thoroughly cleaned and treated with a sealer so that I could apply sheer, delicate layers of artists colors to bring up the natural skin tones. I also touched up the eye paint so that it was more like my current way of painting the eyes. Then I applied the mohair "wig," setting the hair, a few strands at a time, into the sealer for a natural baby look. Aaron is a classic baby boy with a new look. His body is cloth weighted with pellets. His bisque head and hands have a new rosy glow with touches of realistic detail. A joy to have and hold. 9" Tiny Boy was also refreshed and repainted like Aaron giving him a lively new look. It's exciting to see these little faces come to life with radiate color. The final touch of soft golden mohair completes the realistic effect. Another timeless treasure. 9" Infant Chelsea was another darling baby brought from the cabinet for a touch up. I added richer flesh tones, new sparkle to the eyes and the fuzzy curly hair. 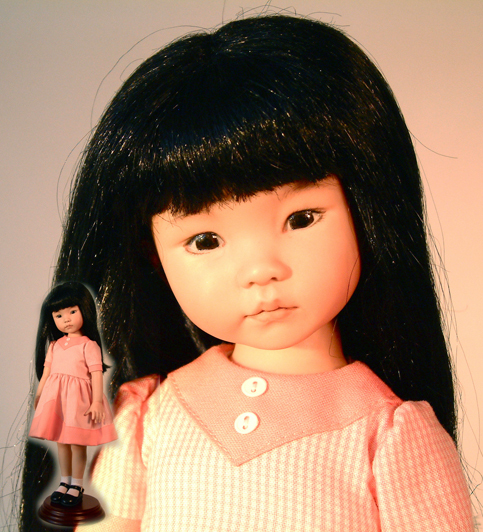 Chelsea is made with bisque head and hands with a cuddly cloth body. She wears a soft cotton knit cuddle suit and hand knit sweater, hat and booties. She comes with here own blanket and toy. 9" Tiny Girl was made and painted at the time of the project. After the initial work was done in China paint the bisque was sealed so that I could apply the artist colors for more realistic color and detail. Finally the eyes were glazed and the fine mohair applied. beautiful gay nineties bicycle outfit designed and made by Sandy Daniels. Nicolette is 12 inches tall. cuddling her little bear Pinky. This doll is #1 in the edition. 11 inches tall. This special doll was made as a prototype. She is a porcelain version of Little Darling #2 which was made consequently as a special vinyl edition. There is no commercially available mold for this body. She was painted by Dianna and she wears a petty cotton dress designed and made by Sandy Daniels. Dianna has committed to donate the entire proceeds from the sale of this doll to the World Red Cross toward helping with disaster relief and recuperation in the aftermath of the devastating Earthquake in the Sichuan are of western China. A rare treasure. 12 inches tall. other team members of the Doll Dreamer's Guild on this site. into the studio to show you our porcelain and vinyl dolls. to fine craftsmanship and artistic excellence.